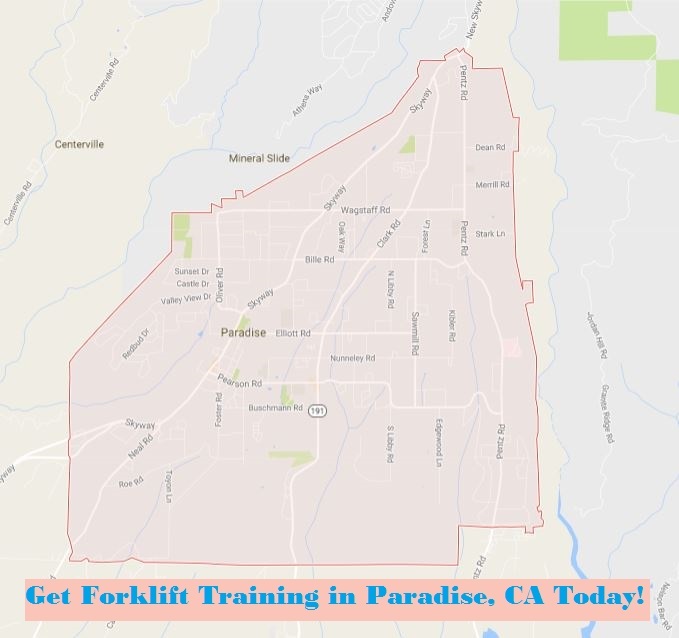 Forklift Certification in Paradise, Get Paradise Forklift Training Today! Nestled in the foothills of the Sierra Nevada Mountains in California, Paradise is a town of natural beauty. Residents and visitors alike admire the tall pine trees and oak trees, comfortable summer temperatures, occasional snow falls, and an environment that makes it easy to get outside and enjoy nature. If you love spending time outdoors and are looking for a place with friendly people to start a new chapter, Paradise is the place for you. Paradise is also a fantastic place to be if you are looking to begin a new career. To keep up with the times and maintain a high quality of life for residents and tourists, Paradise businesses are regularly looking for equipment operators to take care of the heavy lifting and distributing of materials and products that all help to make modern life enjoyable. To get started and build a new career quickly, look into getting your Paradise forklift certification in order to become an OSHA-compliant forklift operator. Why Do I Need a Forklift Certification in Paradise? You don’t need a degree to become a forklift operator, but you still need some education to prepare yourself for the job. If you are interested in starting a forklift career, you need to first complete Paradise forklift training. Comprehensive employee training is the number one way to reduce the number of accidents that occur on work sites. It is also the best way for employers to avoid paying fines for irresponsible working conditions. If you want your job application to be looked over and considered, you need to have Paradise forklift certification on your resume. In order to set ground rules for the type of training forklift operators need to avoid accidents, OSHA has developed regulations that training programs must adhere to. No matter where you get forklift training, including Paradise, you need to look for a program that is 100% OSHA-compliant and delivers all of the education tools you need to feel comfortable getting behind the wheel of a forklift. There are various types of forklifts and various uses for them, so you should also look for a program that teaches each of these types and actions. CertifyMe.net is a forklift training system that teaches new and experienced workers everything they need to know to operate a forklift safely and remain up-to-date on practices and regulations. The program is online and compliant with OSHA. As comprehensive as the Paradise forklift certification program is, it is very convenient and affordable. Taking only about one hour to complete with compatibility on all devices with the internet, you will be trained and certified to operate forklifts at a great company in Paradise such as Andersen & Sons Shelling, Sierra Nevada Cheese Co., Feather River Hospital, and FedEx in no time. Create an account on the CertifyMe.net website and print your forklift certification in Paradise in one hour!